ArtPrize was created to get people excited about contemporary art. So it’s only natural that, when the Grand Rapids Symphony decided to participate in ArtPrize Eight, it set out to get people excited about contemporary music. Not music that sounds like noise and more noise. But music that’s young, hip and energetic. 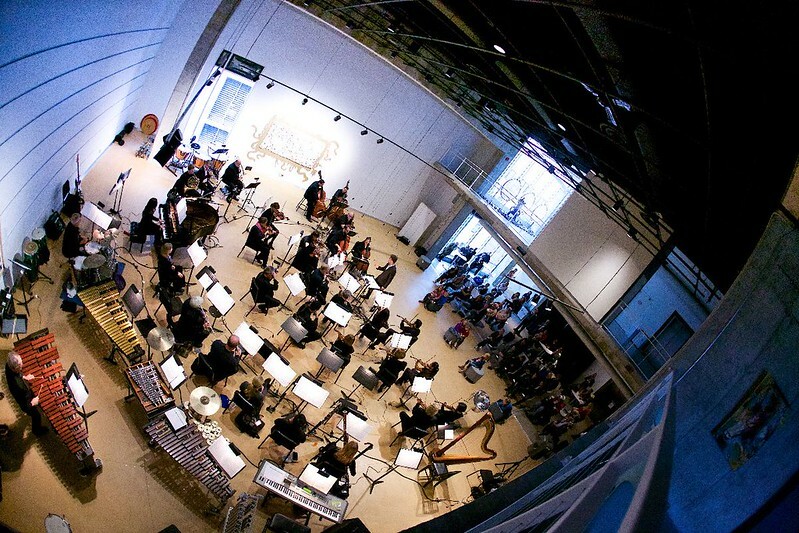 You might say that the Grand Rapids Symphony, which was nominated for a 2007 Grammy Award for Best Classical Crossover Album, is clubbing at Urban Institute for Contemporary Arts during ArtPrize. Free shows featuring special guest Andy Akiho on steel pan and drum set opened on Thursday, September 29, and continue through Sunday, October 2, in UICA’s Fourth Floor Black Box. Half-hour performances are at 1:30, 2:30 and 3:30 pm and at 6 pm, 7 pm and 8 p.m. on Friday and Saturday. Sunday’s program are at 1:30, 2:30 and 3:30. You also can see UICA’s current exhibition, “superusted: The 4th Midwest Biennial” on the Fourth Floor during the free concerts. Nearly 75 people were in the audience for the first of three, entirely different, 30-minute programs on Thursday evening. By the third gig, the audience numbered nearly 100. Guest conductor Jacomo Bairos is leading the Grand Rapids Symphony in new music with hints of rock, funk, Reggaeton, Latin, 1990s electronic, and more. Bairos is artistic director of the Nu Deco Ensemble in Miami, an orchestra that plays music artists such as Daft Punk, Radiohead and LCD Soundsystem. Huffington Post has dubbed Nu Deco "a 21st century orchestra." “Everything you hear on the radio, it came from the Baroque era. It came from the early days of classical music,” said Bairos, music director of the Amarillo Symphony Orchestra. Music includes Akiho’s “wo wALk Or ruN in wEst harlem,” a piece that’s “inspired by a mugging,” Bairos explained. “This piece is absolutely nuts,” said Grand Rapids Symphony Gregg Secor with a smile. Music includes pieces that follow in the footsteps of other classical works. “The Way Through,” which Chris Rogerson composed for the Amarillo Symphony Orchestra, sounds like music of Aaron Copland or Samuel Barber. “If you’re a fan of that older American school of sound, you’re going to hear it a lot throughout this piece,” said Bairos, who guest conducted the Grand Rapids Symphony in DeVos Performance Hall earlier this year in January. Music also includes “Refried Farandole,” which is a contemporary take on George Bizet’s popular “Farandole,” composed by Sam Hyken, who is co-founder, with Bairos, of the Nu Deco Ensemble.